Top Palestinian Arab Leader Collaborated with the Nazis & in the Holocaust -- PLO/PA Calls Israel "Nazi"
In another one of the outrageous and deceitful statements of the PLO and its embodiment in the "palestinian authority," the PLO/PA delegate to the UN accused Israel of acting like Nazis by calling Arab terrorists terrorists. The terrorists don't like to be called terrorists. As a matter of fact, Germany, Austria and Japan were occupied after World War 2. Germans (including Austro-Germans) or Japanese who resisted that occupation in any violent manner might have been called terrorists. In any case, they would have been suppressed violently and firmly. They would have found little sympathy in the world of that time, outside the Arab lands and Franco Spain, for example. Nazi German war criminals were given refuge in Egypt, Syria, Spain and several South American countries. In Egypt and Syria, Nazi veterans like Johannes van Leer obtained high positions in the state apparatus, where they often were used to work against Jews, such as making propaganda against them. The USA, USSR, UK and France were proud of occupying the former Axis powers. They were not ashamed. Russia still occupies vast expanses of pre-WW2 Japan at first occupied by its forerunner, the USSR. Another point is that Mansour did not specifically mention the Warsaw Ghetto Uprising of 1943. Someone at i24 TV, perhaps someone ignorant of real history, inserted the word "[Ghetto]" into Mansour's text in brackets. In fact, there was a Polish nationalist uprising in Warsaw in 1944, a year after the Jewish ghetto revolt. Maybe Mansour was referring to that revolt. Be that as it may, this Polish uprising was suppressed in blood, as the Jewish uprising had been the year before. In both cases, by the German SS and Wehrmacht. Now, the main problem with Mansour's words is that precisely the top leader of the Palestinian Arabs in the 1920s, 1930s, and 1940s, Haj Amin el-Husseini, was a Nazi collaborator. He spent most of the war years in the Nazi-fascist domain in Europe, with a Nazi-subsidized headquarters [by Himmler] in Berlin. He visited Auschwitz and broadcast over Radio Berlin calls to murder Jews ["Kill them wherever you find them . . . "]. He also helped recruit a SS division made up of Bosnian Muslims which was called the Handschar [after khanjar - a kind of traditional Muslim sword]. This Handschar SS division became notorious for its massacres and atrocities in Bosnia and elsewhere in Yugoslavia, Serbia, Croatia, etc. During and after WW2, Husseini and his criminal acts were notorious in the civilized world. However, the Big Four Powers, USA, UK, USSR & France protected him from being prosecuted at Nuremberg as a war criminal, which he surely was. Indeed, Yugoslavia put him on the UN's list of war criminals but the secretary-general of the newly formed Arab League, Azzam Pasha, went to Yugoslavia and persuaded the country's new Communist dictator, Tito, to allow Husseini to go without being prosecuted or punished for his crimes in Yugoslavia [recruiting the Handschar]. It needs to also be stated that in the Spring of 1941, Husseini was in Baghdad, Iraq, then under a pro-Nazi regime where he agitated against the local Jews. This culminated in the Farhud massacre which took place in Baghdad on the Shavu`ot holiday of 1941. In Berlin, his headquarters and institute for training pro-Nazi imams included sons of most of the leading Palestinian Arab families. So Husseini's pro-Nazi crimes were not individual acts but acts for which most of the Palestinian Arab leadership was responsible. It is regrettable that Israeli ambassador to the UN, Danny Danon, assumed that Mansour was referring to the 1943 Jewish Warsaw Ghetto Revolt rather than the 1944 Polish uprising. On the other hand, maybe Mansour was deliberately being vague, trying to allow people to read into his words whatever they wanted. Maybe he was intimating that he recognized the Jewish Ghetto Revolt without explicitly mentioning it. Because in their Arabic-language statements, the PLO/PA does not recognize the Holocaust [nor does the Hamas]. Or only seldom. As we know, Mahmoud Abbas himself, accused the Jews/Zionists of exaggerating the numbers of Jews killed by the Nazis. Israeli Ambassador Danny Danon calls on the international community to condemn the comparison. The Palestinian representitive to the United Nations on Wednesday said that Israel labels its opponents as terrorists in similar fashion to the Nazi regime's suppression of Warsaw Ghetto uprising fighters. ✕ "[Israel’s] representative on the UN Security Council trying [sic] to show that all the Palestinian people who have legitimate rights to resist occupation in legitimate ways he paints them as terrorists," said Palestinian UN ambassador Riyad Mansour, speaking at a press conference in New York. "Guess what, all colonizers, all occupiers, including those who suppressed the Warsaw [Ghetto] uprising, labeled those who resisted them as terrorists,” the Times of Israel quotes Mansour. Israel's UN ambassador Danny Danon rejected the comparison, calling on the international community to condemn the accusation. "Any equalization between the Nazi’s and Israeli democracy is despicable and is worthy of denunciation from the international community," Danon said. "The Palestinians continue to lie to the world and to turn to the international community with crazy claims, rather than to fight incitement and terrorism." 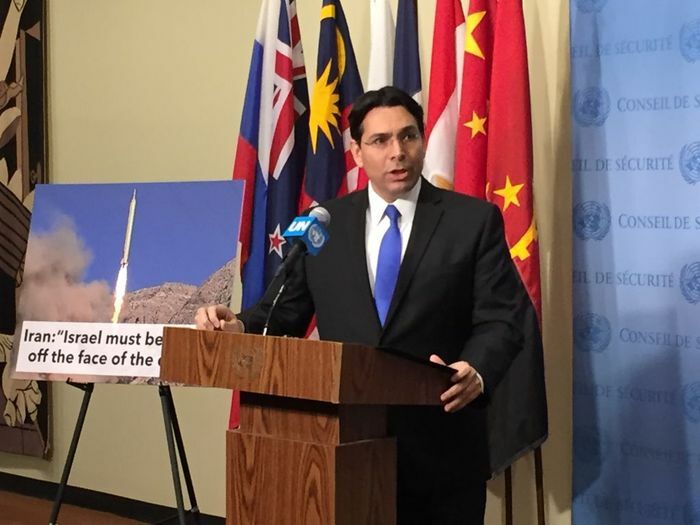 "Israel's Ambassador to the UN Danny Danon speaking at an emergency meeting of the Security Council on March 14, 2016"
Do you have any statement from Meirav Mikhaeli about her grandfather? many people consider her grandfather, whom she never knew, to have been a rat and kapo. He was a traitor, many believe. See the book Perfidy by Ben Hecht. It has also been published in Hebrew.